In this paper, a new image analysis based method for electrospun nanofiber diameter measurement has been presented. The method was tested by a simulated image with known characteristics and a real web. 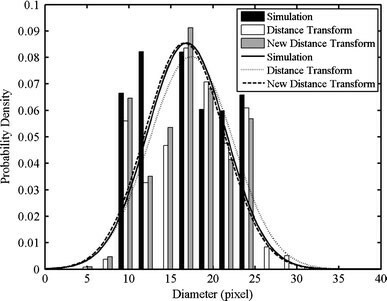 Mean (M) and standard deviation (STD) of fiber diameter obtained using this method for the simulated image were 15.02 and 4.80 pixels respectively, compared to the true values of 15.35 and 4.47 pixels. For the real web, applying the method resulted in M and STD of 324 and 50.4 nm which are extremely close to the values of 319 and 42 nm obtained using manual method. The results show that this approach is successful in making fast, accurate automated measurements of electrospun fiber diameters. Nanofibers are considered as fibers with diameters in the range of one or two orders of magnitude smaller than those of conventional textile fibers. Electrospinning is a straightforward method for manufacturing nanofibers that combines the benefits of a controlled fiber diameter with the possibility for large scale automated production. In this process, a high electric field is applied between a target plate and nozzle of a cylinder containing a polymer/solvent dispersion. As the dispersion is pushed through the nozzle, an electrically charged jet of polymer is formed, which, on drying by means of evaporation of solvent, results in randomly oriented nanofibers collected on the target [1–4]. The fiber diameter is one of the most important structural characteristics in the electrospun nanofiber webs and it may be altered by varying electrospinning parameters such as the dispersion viscosity. However, the extremely small fiber size and random orientation of the nanofibers make the measurement of their diameter very difficult. In addition, large scale production of nanofibers requires unique on-line quality control. To date there has been no successful method developed for the automated measuring of electrospun fiber diameter which has hindered the uptake of this process for large-scale production. The objective of this investigation is to develop a new image analysis based algorithm for measuring electrospun nanofiber diameter. Fiber diameter is usually determined from Scanning Electron Microscopy (SEM) images obtained of the electrospun webs. Due to the small fiber dimensions, high-quality images with appropriate magnifications are required. Routine measurement of fiber diameter and its distribution are carried out by manual method. First the scale is set. Then, pixels between two edges of a fiber perpendicular to the fiber axis are counted. The number of the pixels is then converted to nm using the scale and the resulting diameter is recorded. On a typical image, the diameter of 100 fibers are measured using this method and the histogram of fiber diameter distribution is plotted. This process is very time-consuming and operator consistency and fatigue may reduce the accuracy. Identifying the edges of the fibers needs attention and the measurements are not exactly made perpendicular to the fiber axis. It cannot be used as on-line method for quality control, due to the need of an operator for measurement. Automating the fiber diameter measurement and eliminating the use of the human operator is a natural solution to this problem. An image analysis based method was proposed by Pourdeyhimi et al. for measuring fiber diameter in nonwoven textiles. In this method, a binary image of the textile is used to create a distance map and skeleton. The fiber diameter may be determined from the values of the distance map at any pixel location on the skeleton. However, the occurrence of a broken skeleton at intersection points is a main challenging area within the use of this method. Since two or more fibers cross each other at these intersections, the value of the center of the object in the distance map doesn’t coincide with the fiber diameter at these points because it isn’t associated with a single fiber. The problem becomes more serious as fibers get thicker and for points where more fibers cross each other. Hence, the method fails in measuring fiber diameter at intersections. We established a new method based on image analysis in which the problem associated with the intersections was solved. The method uses a binary image as an input. Then, the distance transformed image and the skeleton are created. It can be noted that the skeleton which is obtained by the process of skeletonization or thinning often contains short spurs which may be cleaned up through the use of a pruning procedure . In order to solve the problems associated with measuring fiber diameter at the intersections, we first use a sliding neighborhood operation  to identify the location of these points. Then the thickness of each intersection is recorded from the distance transformed image. Finally the intersections are deleted from the skeleton image based on their measured thickness. Figure 1 shows a simple simulated web, its distance transformed image and the skeleton after pruning and deleting the intersections. It is apparently seen that both of the distance transformed image and skeleton are broken at intersections (Fig. 1b, Fig. 1c). As it is observed, the problem is more pronounced for thicker fibers and intersections with more fibers. In the next step, the obtained skeleton after deleting the intersections is used as a guide for tracking the distance transformed image and the diameters are computed from the intensities of this image at all points along the skeleton. The data in pixels may then be converted to nm and the histogram of fiber diameter distribution is plotted. In order to validate the method, test samples with known structural characteristics are required. Algorithms for simulation of nonwoven mats have been proposed by Abdel-Ghani et al. and Pourdeyhimi et al. . One of the most important features of simulation is that it allows several structural characteristics such as fiber diameter and orientation distribution and web density to be taken into consideration. Since these characteristics of simulated images are known exactly, one can employ them to test the usefulness of algorithm used in characterizing diameter and other structural features. Lately it has been discovered that the best way to simulate nonwoven mats of continuous fibers is through μ-randomness procedure . In this scheme, a line with a specified thickness is drawn at a distance away from a reference point and perpendicular to an angular position [7, 8]. In this study μ-randomness procedure was used for generating a simulated image with known characteristics. Fiber diameter determination by the use of image analysis requires the initial segmentation of the micrographs in order to produce binary images. The typical way of producing a binary image from a grayscale image is by global thresholding [6, 9] where a single constant threshold, usually selected by trial and error, is applied to segment the image. Global thresholding is very sensitive to any inhomogeneities in the gray-level distributions of the object and background pixels. This effect can be eliminated through the use of a local thresholding [6, 9] scheme. Automatic selection of the appropriate thresholds can be carried out based on, Otsu’s method . Note that, since the process is extremely sensitive to noise, before the segmentation, a procedure to clean the noise and enhance the contrast of the image is necessary. Fiber diameter distributions for the simulated image given in Fig. 1a obtained by different methods are shown in Fig. 2. It is apparently seen that fiber diameter distribution measured by new distance transform method is so close to the real distribution (simulation). Distance transform method tends to overestimate fiber diameter and this is seen by a shift in the distribution toward higher diameter. Furthermore, the distribution obtained by this method is broader than real. These are due to inaccurate measurement of fiber diameter at intersection points which was solved in the new method. A simulated image with the diameter sampled from a normal distribution with the mean (M) of 15 and standard deviation (STD) of 4 pixels was used to test the validity of the method. It is noteworthy that the true M and STD of the simulated image (15.35 and 4.47) varies slightly with those used as simulation parameters. Figure 3a and b respectively show the simulated image and its diameter distribution obtained from the new distance transform method. The M and STD of fiber diameter obtained by this method were 15.02 and 4.80 respectively, showing a good correlation between the calculated and true M and STD of the simulated image. Using this method, there can be up to half a pixel error in either direction when measuring the fiber diameter, resulting in a total measurement error of up to 1-pixel. The slight differences observed between the calculated and true values could be attributed to this 1-pixel measurement error, some parts of branches remaining after pruning and other slight variations in the skeleton adjacent to the deleted intersections. Furthermore, the fiber diameters at the deleted intersections were not counted within the measurement and may contribute slightly to the variation observed. To prove that this process is suitable for determination of fiber diameter on real samples, a real nanofiber web was obtained from electrospinning of polyvinyl alcohol (PVA) with average molecular weight of 72,000 g/mol (MERCK). The micrograph of the electrospun web (Fig. 4a), was taken using a Philips (XL-30) Environmental Scanning Electron Microscope after gold sputter coating. Figure 4b shows the diameter distribution for the real web. The respective M and STD of the fiber diameter obtained by this new method were 24.74 and 3.85 in terms of pixel and 323.7 and 50.4 in term of nm which are in good agreement with the values 24.36 and 3.19 pixels and 318.7 and 41.8 nm obtained from manual methods. The differences here can also be attributed to the different number of measurements taken between the methods used (over 2,000 for our method versus 100 for the manual method). Nevertheless, in each case presented, the difference observed was within 1-pixel measurement error suggesting the main limitation with the process is with the resolution of the taken image. 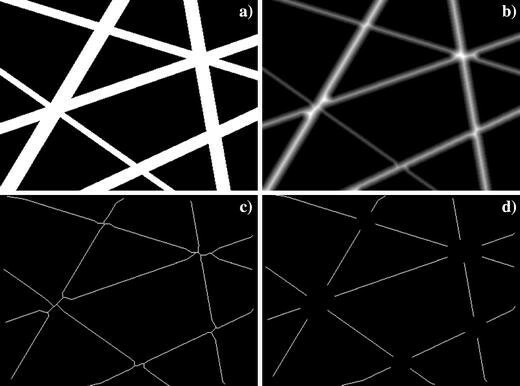 In this study, a new image analysis based method for assessing nanofibers diameters was successfully developed. The validity of the method was tested using a simulated image as well as an image of a real electrospun nanofiber web. In the case of the real web, local thresholding was applied on the micrograph of the web taken from SEM to attain the necessary binary image. The M and STD of fiber diameter which were obtained using this new method were extremely close to true values on the simulated image. For the real web, M and STD of fiber diameter measured by the method were also in good agreement with those obtained from the manual method. The results show the effectiveness of the method for diameter measurement. The method is automated, accurate, and much faster than manual method and has the capability of being used as an on-line technique for quality control.